Good morning to all you 'rons, 'ettes, lurkers, and lurkettes. Oh, and we've got a new category of readers, escaped oafs and oafettes ('escaped oafs' is an anagram of 'Ace of Spades'). Welcome once again to the stately, prestigious, internationally acclaimed and high-class Sunday Morning Book Thread, a weekly compendium of reviews, observations, and a continuing conversation on books, reading, and publishing by people who follow words with their fingers and whose lips move as they read. Unlike other AoSHQ comment threads, the Sunday Morning Book Thread is so hoity-toity, pants are required. Even if it's these pants, which are so ugly, they're actually advertised as such. ...with a collection of around 20,000 books and memberships starting at $125 a year, with lower student and youth rates. 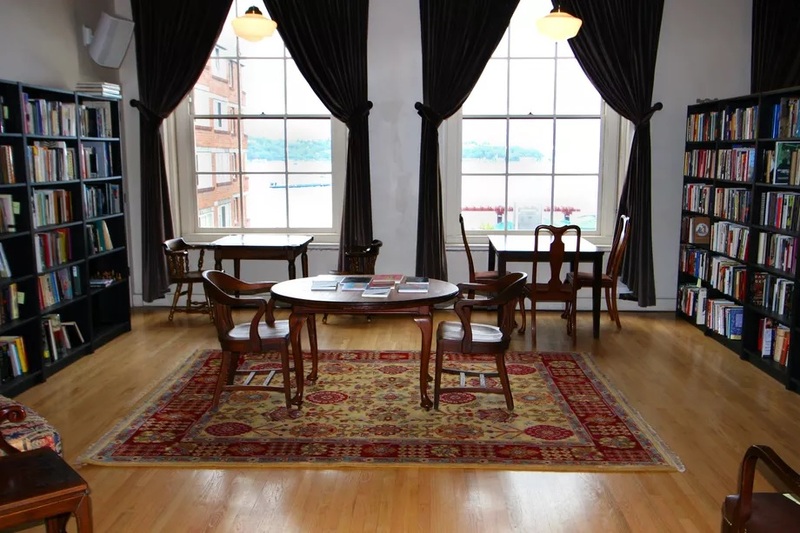 Previously located farther south in the downtown YMCA building—closer to the downtown Seattle Public Library branch—it reopens in the market’s Economy Building at First Avenue and Pike Street with views of Elliott Bay on July 9. The ADA-accessible facility will include three reading rooms and a kitchen, plus a public lobby where everyone, member or not, can browse some of the collection. Those who are visiting and want to explore a little deeper can buy daily or weekly memberships for $5 or $15, respectively. Edwin is so dedicated to creating a space for conversation that Estelita’s doesn’t even have WiFi so people can stay engaged without getting distracted. In the future, Edwin said he hopes the library can host lectures, history lessons, poetry performances, and a book club. A space for "conversations." Right. I'm sure he's interested in any opinion, be it left, wacko left, or really wacko left. I wonder if he would be open to a series of lectures on why the only solution to 3rd-world poverty is a free-market economy with minimal governmental regulations? Or, if Betsy DeVos wanted to speak on education, would "lifelong activist" Lindo even allow her inside his library? Because the left is all about "having conversations." An AQUATION is a large amount of rain. Usage: So I think this means that if you get 4 times the normal rainfall, it's a quadratic aquation. Portray(s) the Northern Ireland "Troubles" of the 1960s-1990s in [an accurate] manner? The reason I ask is that of late I'm beginning to think that if there is an American Civil War 2.0, that's what it's going to be like -- not so much military movements, fronts, big battles, entire cities being cut off, etc. as it is an endless series of bombings, riots, assassinations, and other small-scale stuff in which a lot of innocent people get caught. I remember an Irish guy commenting on the difficuly in piecing together all of the disparate elements of the low-level war between Northern Ireland and England into an accurate picture by saying, "if you're not totally confused by the Troubles, you don't really know what's going on." That's pretty "Zen" for an Irish guy, but they drink a lot, so there you go. Anyway, near as I can understand, there are (or were) a number of different Irish groups fighting the British, buit they couldn't agree on goals or methods. And they all seemed to hate each other as much as they hated the British. That's the extent of my knowledge. So do any of you morons have recommendations? The author of Peter Rabbit and other tales, Beatrix Potter is still, after a century, beloved by children and adults worldwide. In this first Cottage Tale, Albert introduces Beatrix, an animal lover and Good Samaritan with a knack for solving mysteries. With help from her entourage of talking animal friends, Beatrix sets out to win over the human hearts of Sawrey, where she's just bought an old farm--and plans to stay. Charming is the word that most people use and I agree. As I continue to read it, I see more and more Tolkien and Shire aspects in it. That may not be deliberate by Albert since it is based in an area and time that Tolkien clearly loved. To double check my impression, I re-read the Shire parts in LOTR, both the early chapters before things got serious and the concluding chapters of Return of the King. That similarity is very appealing to me. I was surprised none of the Amazon reviews mentioned it. Susan Wittig Albert is a prolific author who has written many mysteries. Jim Wilmot is confused. A beautiful, mysterious maiden has fallen into his lap—literally! It isn’t clear what Karen has in mind, but he can’t help hoping it is love. Meanwhile the girl who loves him beyond any shadow of a doubt has gotten tired of waiting and decides to move on. He’s shocked when Erin is cold to him and even more shocked when she becomes engaged to one of his best friends. It turns out Karen has an astonishing secret, which Jim is the last one to know. He realizes what he really wants just when it seems impossible to get it. Also available in paperback for $11.95. We think of magical creatures as being superhuman in every way. Their problems fascinate us because they are beyond anything we could possibly deal with ourselves. But behind the super strength, extraordinary abilities, and fantastical back stories, these mythical beings have struggles and trials that are remarkably unremarkable. Join us in discovering the humanity that beats in the hearts of these non-human creatures. Frank Ross might seem like any other young man who’s struggling to care for a disabled sibling on low pay in a bad economy. But Frank’s in a bigger pickle than most: his brother Toby bears the stigmata, the marks of Christ’s Crucifixion, and bleeds in the presence of evil. When white supremacists riot in their neighborhood, Toby lands in the hospital alongside the best friend he’s never met and her three flatmates, all of whom are prophets. Yet this one day of intense suffering may bring all six of them a happy ending none of them have foreseen. Available for Kindle $4.99 pre-order. It will be automatically delivered to purchasers' devices on July 21st.